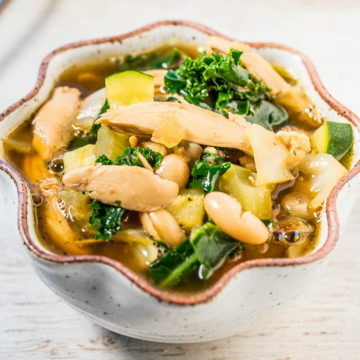 Successfully saved Easy 30-Minute Kale, White Bean, and Chicken Soup to your Calendar. You can also save the ingredients to your Grocery List. The soup is easy, ready in 30 minutes, hearty, and healthy. It’s packed with flavor, texture, and even for those who think that soup can’t make a meal, this one will change your mind. To save time I used shredded rotisserie chicken. The beans add heartiness and protein while the kale, cabbage, and zucchini add texture. There’s sweet Vidalia onions, garlic, and celery for a flavor boost.. I use low-sodium chicken broth, low-sodium beans, and add a bit of salt to the soup so I can control the overall salt level. The saltiness of low-sodium broth, beans, rotisserie chickens, and personal preferences for salt all vary so salt to taste.